Now I wish I had put makeup on. I had no idea this would become a sacred document!!!!!!! Thank you, Terry. After I have it notarized, I'll highlight my favorite parts of each post and have it framed!!! Another trip down Memory Lane... these pages (from the Rickeybird's Scrapbook) are from 1990, 1991, 1005 and 1996. The Rickeybird visited SANTA!!!! The looks on Santa's and Rbird's faces are funny. Me? I'm just smiling away! Last edited by Terry57; 07-09-2017 at 02:54 PM. You're a bit older than I thought! I'm not even gonna correct that. 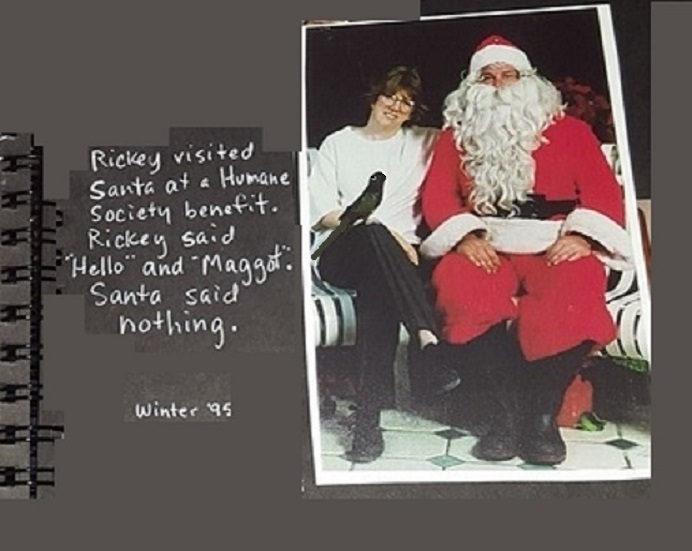 I have to ask...Did Rickey get what he wanted from Santa that year? Yeah, RBird got what he wanted from Santa, which was for Santa to GO AWAY. I think the feeling was mutual. I want to start a new thread called "Rickeybird's Scrapbook, 1984 to present" since I plan to keep adding photos for a while. I will include the three pictures from this thread.